The Hurtigruten’s cruise ship MS Trollfjord collided with dock at Risoyhamn in Andoy, Norway. The vessel was proceeding to dock into the port, when hit the concrete of the pier and several plates fell through the hole in the bow. Fortunately there were no reported injuries among the passengers and crew on board of the passenger ship. MS Trollfjord berthed shortly after the accident and started assessing the damages. The local authorities and port state control requested special survey and inspection of the ship. The investigation for the root cause of the collision is under way, as the details and circumstances, which lead to collision are not clear. 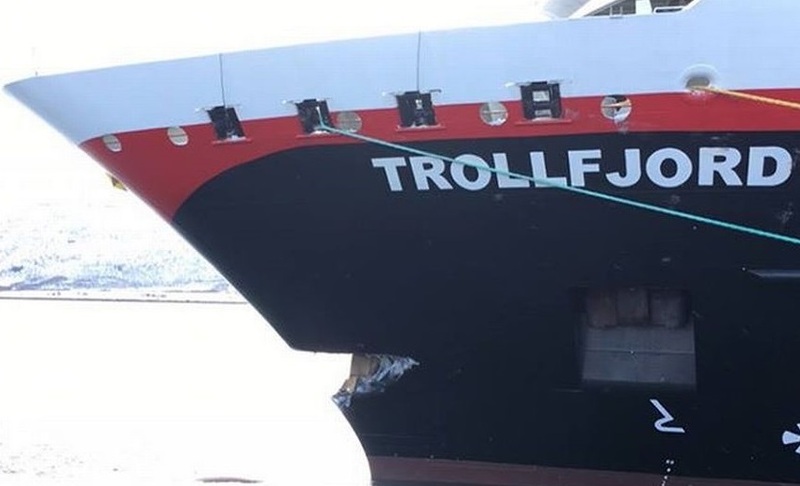 “MS Trollfjord collided with the pier in Risoyhamn. There are no injuries on either the guests or crew”, said the communications manager of Hurtigruten, Rune Thomas Ege. “Safety is our highest priority and we will examine the damage to the ship carefully and remain berthed until we get a full inspection”, added he. Following the collision the ship suffered visible damages in the bow, but all were above the waterline and did not caused water ingress or issue for the seaworthiness. There was also serious damage to the wharf as well. There was no panic among the passengers during the accident, but some of them were a little anxious. According to the schedule, the vessel was planned to continue on the journey south to Sortland. The cruise ship MS Trollfjord (IMO: 9233258) has overall length of 136.00 m, moulded beam of 22.00 m and maximum draft of 5.20 m. The deadweight of the ship is 1,180 DWT and the gross tonnage is 16,140 GRT. The vessel was built in 2002 by Bergen Group Fosen in their shipyard in Rissa, Norway.